"RETURN OF THE HUNTERS - A D-DAY PORTFOLIO"
Throughout the early morning of 6 June 1944, men of the US 29th Infantry Division had fought their way yard by yard across the bloody shingle of Omaha Beach, but the strong German opposition was unexpected. It was the same on most sectors of ‘bloody Omaha’ beach that morning. Showing unparalleled levels of bravery and determination, the US infantrymen finally prevailed and within days the scene on the beach was a hive of activity as ‘Mulberry A’ - one of two giant artificial harbours that had been towed across the Channel – was erected off this once-deadly beach. Anthony Saunders’ intensely graphic new painting depicts a pair of RAF Typhoons from 245 Sqn over the American Mulberry. They race back to their base in Hampshire to re-fuel and re-arm after delivering a blistering rocket attack on German positions behind the everwidening Normandy beachhead. 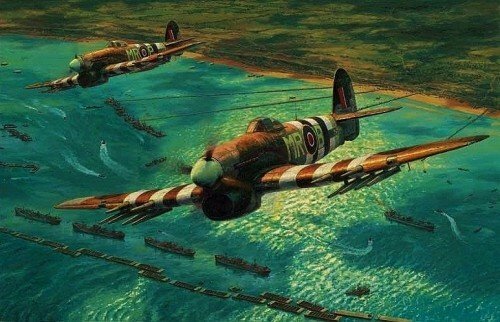 Each print has been personally signed by three highly distinguished Pilots who flew Typhoons in support of the Allied invasion of Normandy. Every print is endorsed by the artist and hand-numbered.